USADA announced today that an independent arbitrator from the American Arbitration Association North American Court of Arbitration for Sport (AAA), has rendered a decision in the case of Walter Davis of Fresno, Texas, an athlete in the sport of track & field. The arbitrator found that Davis committed an anti-doping rule violation, and imposed a one-year suspension and loss of results for his failure to properly file his whereabouts information. Davis, 34, became a member of the USADA Registered Testing Pool in 2001. The USADA Registered Testing Pool consists of a select group of athletes subject to certain whereabouts requirements in order to be located for USADA Out-of-Competition testing. Davis failed to keep USADA updated on his whereabouts and, as a result, accrued three Whereabouts Failures between July of 2012 and July of 2013. Under the USADA Protocol for Olympic and Paralympic Movement Testing and the International Association of Athletic Federations (IAAF) Anti-Doping Rules, both of which have adopted the World Anti-Doping Code (“Code”), the combination of three Whereabouts Failures within an 18-month period constitutes a rule violation. Davis’ one-year period of ineligibility, began on April 16, 2014. 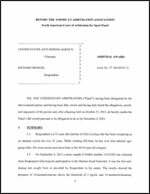 As a result of the violation, Davis has also been disqualified from all competitive results achieved on and subsequent to July 1, 2013, including forfeiture of any medals, points, and prizes.